Baby changing facilities can be found across all three terminals, either inside or nearby the ladies' toilets. Our baby changing facilities include chairs to make breastfeeding easier. Manchester Airport is also delighted to be trialling a new breastfeeding facility for nursing mothers in Terminal 1. 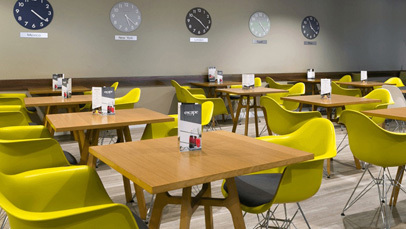 Manchester Airport promotes feeding across our site and we do not restrict where this can take place. However, if a nursing mother would prefer a quieter and/or more private area, they can make use of this relaxing and comfortable facility. There is a baby change facility nearby and food warming facilities are available within the restaurants.